Envirogel is our friendly absorber and used in all our Vent & Transformer Breather products. Envirogel desiccant is the latest alternative to blue (cobalt chloride) indicating silica gel. Envirogel indicates an orange/yellow colour when active and changes to green when the desiccant becomes saturated. As with non-indicating silica gel, the material is a refined form of silica which is produced by the reaction of a mineral acid, usually sulphuric, and a sodium silicate solution. 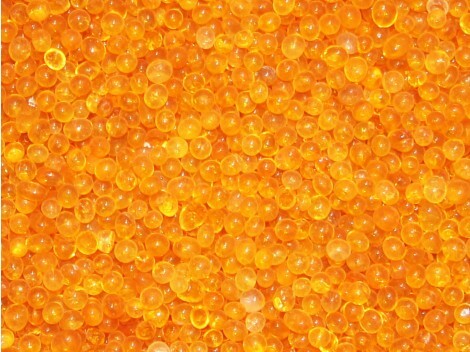 The beads are impregnated with a safe organic indicator which changes colour as the desiccant becomes saturated. Envirogel is capable of adsorbing up to approximately 30% of its own weight of water from the surrounding atmosphere at 50% RH and 25°C. Envirogel is produced in the beaded form and has a high dust attrition resistance. Also, the uniform bead size reduces gas flow channelling and minimizes pressure drop. Envirogel may be reactivated for re-use by heating. However, after several reactivation cycles the material may disintegrate into powder. This in turn, reduces the adsorption capacity of the material. Please contact us for the specific reactivation procedure. The adsorption capacity of Envirogel can be destroyed by contamination with dust, grease or petroleum products. Heating the material above 120°C will also reduce the adsorption capacity and destroy the impregnated colour change indicator.